Out of stock, new stock due in mid April, pre-orders available. 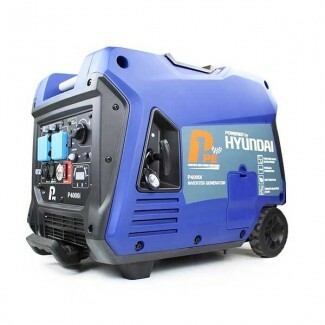 The P4000i is a compact yet powerful portable inverter generator powered by the Hyundai IC225D 4-stroke single cylinder air cooled engine, providing a reliable power source. 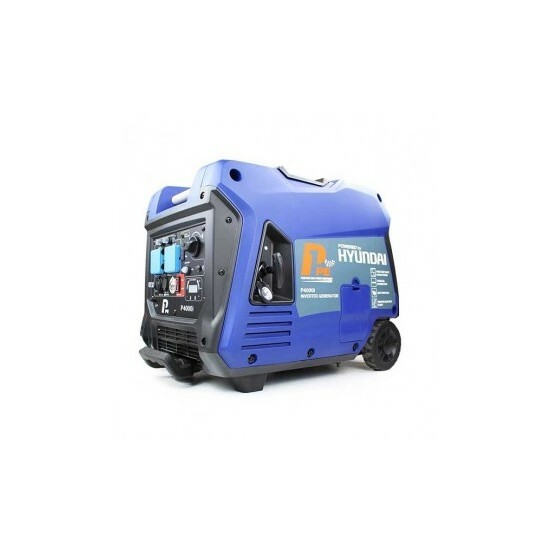 Producing 3800w maximum the P4000i is ideal for caravans and motorhomes as it allows you to take the modern luxuries from home with you wherever you go. The P4000i symmetrical design allows you to store it easily and transports in the back of a van or car. Weighing only 48kg and measuring just 630x400x520mm, and with the folding front handle and fixed rear handle plus heavy duty rear wheels makes transportation easy across a variety of surfaces. It houses a new inverter board designed to cope with the extreme inductive loads applied when using power tools and electric motors with high startup currents. The new LCD display makes it easy to monitor the performance of the generator, displaying voltage, frequency and hour count. The control panel features two 230v sockets for use with any appliance which use a standard 3-pin 13A UK mains plug, as well as a 12v DC battery charging outlet and a USB port for charging mobile phones and ipads. It’s ideal for a variety of uses. Producing a pure sine wave output is ideal for powering most electronic equipment. Digital overload protection will shut the generator down should the load pass the maximum threshold, and low oil shutdown also turns off the generator should the oil levels drop too far. Already an economical generator, the P4000i also has the added benefit of an “ECO” mode which, when selected, will lower the engine revs to match the load being applied, which in turn increases the fuel economy, lowers the noise produced and extends the lifespan of the engine.